This has always bugged me and I may be being too technical about it, but "Exactly 430 miles" from WHERE? Three Forks, Montana - 430 miles from "Twin Peaks"
Mmmm, maybe. It's plausible but something doesn't seem right to me and I know that strip of Freeway and area fairly well. Nothing looks like it did in the show in that specific region. Maybe Three Forks is where it was intended to be, but they did a piss poor job of filming in a location that actually looks like Three Forks/Western Montana. I always assumed 430 miles was meant to be with Glastonbury Grove as its starting point, but in what direction was the mystery. I also assume the choice of 430 was abitrary if referring to a fictional place for the crossing over point, because the key to the crossing seems to be the amount of electricity in the air. But whether there is numerlogical significance to the number 430 and that's why it was chosen, I don't know. At this point symbology seems more likely than 430 referring to a "real world" place. Being English, I can't comment on what Three Forks looks like and whether the crossing point matches it. But I am curious as to whether the crossing point is meant to be the place where earlier Mr C crashed, puked and was arrested. Coop sees that happen from the Waiting Room/Black Lodge, which I find interesting, like as if the crossing point and the lodges are part of the same quantum tapestry. At the very least the crossing point and Mr C's road look similar - at least in my memory anyway. I could be wrong of course. I need another rewatch really. wait, are you really wondering? - because, yes, it's Three Forks again. But only as the bird flies, not by roads. so, maybe more Jerry's route? I also just got to thinking about this with regard to Laura. In one fork of the timeline, she died. In another, she did not die. Perhaps it is worth thinking about a third, in relation to Carrie Page? Of course, I suppose this whole Three Forks thing could be a coincidence, and Lynch just chose 430 because it adds up to 7, but I'm inclined to think he was aware. He is from Montana, after all. I always assumed it was 430 from Jackrabbits Palace. I literally have no explanation for this except it was a coordinate/location than Briggs outlined. And it seemed to be the one that Mr. C was looking for, until the fireman swiped him left and sent him to the Sheriff's station. But 430 from Jack Rabbits palace is undecipherable as we don't have a concrete location to start from. But I did some research early on, because it bugged me that 430 miles from the basement of the Great Northern, or the Sheriffs Station, or Jack Rabbits Palace, seemed to end up in a desert climate with large power poles and transformers. I have driven to the Dakota's from Bremerton Washington, the only desert climate was in eastern Washington between Wenatchee and Spokane...barren but only 200 - 230 miles away. You would end up just outside of Missoula, not a desert as it is just inside the Nez Perce national park. You would be in the Pacific Ocean. North would only put you into Ice and Snow. - 430 miles lands you at Williams lake Canada off of the Caribou Highway...Never been there but I get shivers thinking about it. You will end up in Grants Pass Oregon, NOTHING about this place is desert climate, it's probably more green than where they left somewhere near Snoqualmie. You end up just outside of Boise in a desert like area with a lot of power lines. However we are trying to mix the real and fictitious, good luck! Yes, if you look at that article I posted, they begin with the coordinates that are shown in the show, which are presumably for Jack Rabbit's Palace. Three Forks is apparently 430 miles from there. The Three Forks thing is the only one I have come across that I found interesting to think about. I'd be more than happy to consider other ideas, if they're out there. Do you mean that if I type in Twin Peaks interdimensional portal in google maps this will appear? The portal crossing scene was filmed on Mt Emma Road, with the Motel exterior shots being located on nearby Pearblossom Highway. Both are over 1000 miles away from Snoqualmie is located. But then that's just filming locations. In terms of fiction...I'm still meditating on it ? Three Forks like area makes the most sense conceptually, but Boise like area makes the most sense visually. I know its all fiction and I'm just slapping around a dead horse that wasn't all that important to begin with. It's just a detail that has always bugged me and Lynch always seems so finite about details and he has lived in Pac NW (as has Kyle M) & Montana so he knows the basics of the terrain. Thus I wondered if maybe I was mistaken on thinking it was supposed to be 430 miles from TP or JR Palace or Glastonbury Grove (sp?) or some other specific and familiar place. 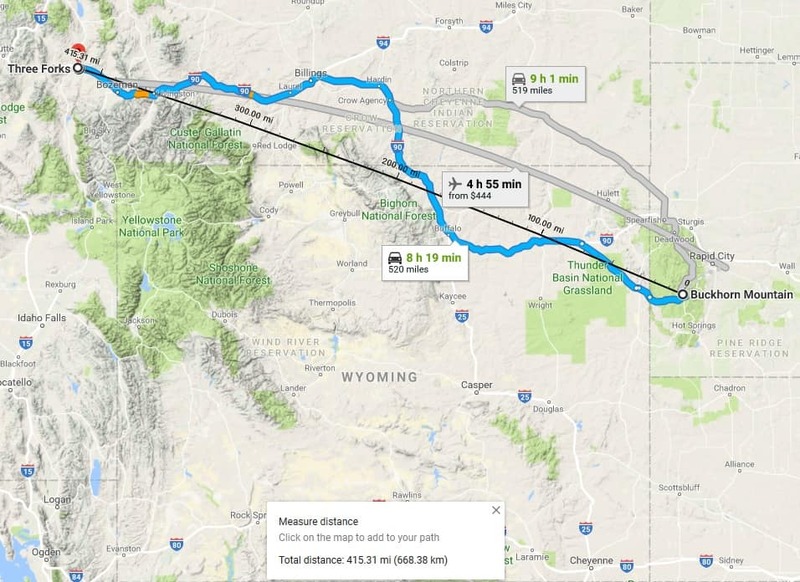 I was questioning whether I had missed something or that perhaps they were traveling from some completely OTHER starting point that got them to a place that looks like Nevada or Southern Utah or New Mexico or somewhere like that. But everyone seems in agreement that the starting point is one of our beloved spots in NE WA. And I was really wondering, just not feeling competent enough at the moment to figure it out. Thanks so much and yes, definitely Jerry's route. Still more than 5 miles from the Canadian Border, but interesting nonetheless.